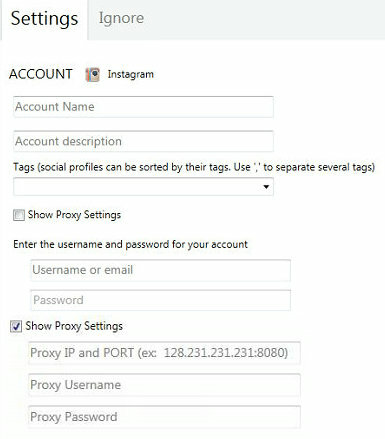 You can have multiple accounts in social media platform and to handle them with more security you can take help of proxies for mass planner. If you do this, you will be able to make the accounts more secure because you will not log in through the same IP. You can add the proxies with all the accounts in which you are going to log in. It’s can Schedule content on your social media for posting, And helps to handle your multiple accounts on Instagram, Facebook, Google+, Twitter, Pinterest, LinkedIn without any problem. The Mass Planner can automatically follow, join new Groups,share your posts to other social media accounts that based on keywords for your niche. Actually now in the web world it is always risky to handle multiple accounts of social networking websites. So, on that note it can be said that this thing will help you to make your Facebook account much more secure. The process of doing the same is extremely easy. What you need to is that you have first to enter into your current social media account. You will go to profile then. For example, In the Facebook account, you will get three new textboxes. You will enter the port and IP in a particular format. The format is IP: PORT. If you are doing it for public proxy, it will be enough. However, if you want to do the same for the private proxy, you will need to put the Username and your password in the following other two fields. It can be said for sure that private proxy will always be better because this will make your accounts more secure. This is why private proxy is always recommended. Proxies for massplanner thus can be done quite easily. After you complete the whole process, you need to go to a site called whatsmyip. If you go there, you will be able to check whether your proxy setting is going fine or not. Accordingly you can go for logging into your social media account. You need to log in, and the things will be ready. So, it is extremely easy to complete the whole procedure and check whether that is fine or not. There are some things which you can keep in your mind when you are thinking of doing Proxies for mass planner. You can always go for the private proxies. In most of the places, it will usually cost $1 -$2 per month. So, if you are taking the matter of internet marketing quite seriously, it will not at all be a problem. Free proxies mean the public proxies can also be used. However, in that case, the mass planner will work delayed, and it can cause problems for you in some cases. With the same proxy, you will be able to run two to five accounts without any sort of problem. It is true that it is not mandatory to use a proxy for these many accounts if you have. However, for the safer side if you want you can always go for that. So, if you go through the process of Proxies for mass planner you will not only be able to handle your account without any problem but at the same time the accounts will be much more secure.